Two Wharton Business School students struggled to find affordable and convenient seating options for their apartments. So they created Burrow, a hot furniture startup and Chestnut Street Ventures investment. All that Stephen Kuhl wanted was a comfortable, affordable couch that he could have quickly delivered to his new apartment. That didn’t happen. So he bought a couch from IKEA, rented a truck to pick it up, and spent several hours building it—only to discover that the sofa he settled for (and worked so hard to get) didn’t meet his needs. A Wharton Business School classmate, Kabeer Chopra, also needed a couch at the beginning of the school year. He desired higher quality than what was on offer at IKEA, so he visited West Elm and plunked down double what Kuhl had spent. Not wanting to pay the extra $200-300 required for white glove delivery, he borrowed a cart from his apartment building, walked it to the store, and used it to awkwardly push his new purchase home. Like Kuhl, Chopra found his expectations weren’t met. A few weeks later, Kuhl and Chopra swapped couch shopping misery tales while brainstorming ideas for an entrepreneurship project at Wharton. The two recognized they shared a common experience that might entail opportunity: Why wasn’t there an affordable, quality couch that could be quickly and cost-effectively delivered? And were they the entrepreneurs who could bring it into existence? The more Kuhl and Chopra researched the industry and customer experience within it, the more they grew passionate about innovating in a space that had not been disrupted for quite some time. Within a few months of discussing their shopping miseries, he and Chopra founded Burrow, a company that would soon build high-quality, modular sofas that could be on a customer’s doorstep within one week. 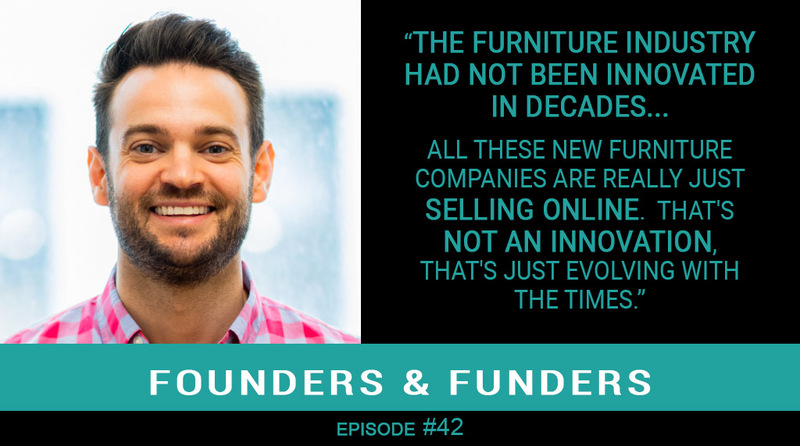 Listen to this podcast for an entertaining recap of how Kuhl and his partner overcame one challenge after another to turn their sofa-shopping nightmares into a business dream come true. And don’t forget to subscribe to Founders & Funders on iTunes, TuneIn, Stitcher, Google Play, iHeartRADIO, and Android.